A hidden gem in the heart of London, Sofitel London St James lies discreetly at the heart of the most prestigious and lively area of London, ideal for both business and leisure guests. Created in a magnificent grade II listed building, the 185-room hotel boasts accommodation to suit every taste. Offering a sophisticated but relaxed welcome, the hotel features a renowned French restaurant, Brasserie Roux, an elegant cocktail bar, a sumptuous afternoon tea lounge, as well as a gym and relaxation space, So FIT by Sofitel, with the most advanced fitness and wellness equipment and an exclusive Sha Chair, a unique multi sensory experience. The hotel comprises 185 rooms including 9 Junior suites, 6 Prestige Suites and 1 Royal suite, all featuring high definition flat screen television with 110 channels and a library of 80 movies, WIFI and hard wired high speed internet connections, laptop sized safe, hairdryer, ironing board and tea and coffee making facilities. Cancellations must be made directly to the hotel by 14.00 hours on the day of arrival. In the event of a non-arrival or late cancellation, the cost of one full night will be levied against the provided card. Brasserie Roux: Inspired by Albert Roux, Brasserie Roux is situated at 8 Pall Mall in an extraordinary double-height space, formerly the banking hall of Cox and Kings Bank. Located on the ground floor of the Sofitel St James hotel with its own entrance on Pall Mall, the one hundred-seat brasserie offers classic French brasserie cuisine in an atmosphere of informal elegance. The design theme throughout the brasserie focuses on a young rooster - the coat of arms of the building's former owners, Cox & Kings, and the symbol of France. The interior designer, Pierre-Yves Rochon, has created an elegant atmosphere with buttercup yellow walls and contemporary furniture upholstered in dark green and red fabrics. Three 15ft arched windows dressed with matching pale yellow and white American blinds overlook Pall Mall and Waterloo Place and help create a stunningly spacious yet refined area in which to enjoy honest Brasserie cuisine created by one of the world's most famous chefs. St James Bar: A cosy and traditional bar with fire place and cigar humidor. The St James bar offers one of the most extensive range of non-vintage and vintage Champagnes in London, with a large selection available by the glass. In addition to the classic list of cocktails catering for all tastes and preferences, the menu features an impressive choice of Champagne and Martini cocktails. Snack bar, Musical entertainment. Opening hours : 08:00-01:00 Indulge in the most decadent of all British traditions and enjoy a delightful Afternoon Tea. The conference & banqueting facilities comprise eleven state-of-the-art suites. The hotel caters from discreet board meetings to lavish banquets. Backed by exceptional standards of service by a team of highly professional staff and state-of-the-art audio visual facilities, the suites have the flexibility to cater for meetings from 2 two 170 persons and receptions for 300. The hotel also features a Sofitel concept boardroom with an adjacent dining room. The hotel is a stylish venue for banquets, events and weddings. The conference and banqueting suites benefit from their own separate entrance on Waterloo Place. Fitness: The gym and relaxation space, So FIT by Sofitel, with the most advanced fitness and wellness equipment and an exclusive Sha Chair, a unique multi sensory experience. Spa: This stylish five-star hotel is now further enhanced by a luxury spa, So SPA by Sofitel, with two highly prestigious brands from French cosmetology, Carita and Cinq Mondes. Distributed over three floors, the spa has retained the original features of the building, and offers a unique and personalised experience with a Spa Butler. From smart casual to black tie. Dogs up to 10 kgs are accepted and must not be left alone at any time. Pets must not roam in the public areas of the hotel. 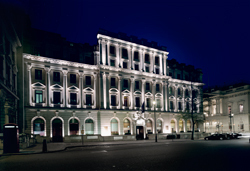 This hotel has one of the finest addresses in London, right on the corner of Pall Mall and Waterloo Place. The hotel lies in the heart of St. James’s, a prestigious and lively district of London, within walking distance of St. James’s Park, Buckingham Palace and the renowned gentlemen’s clubs. The hotel is also less than a five minute stroll from Trafalgar Square, city centre theatres and the fabulous shopping on Regent, Piccadilly, Oxford and Bond streets. 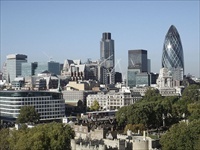 The hotel has the ideal location from which to discover and enjoy central London. The hotel is ideally located right in the heart of London, a two minute walk from Piccadilly Circus underground station (Piccadilly line). London Heathrow - 40 minutes by underground to Piccadilly Circus or Heathrow Express and a taxi. London Gatwick - 40 minutes by Gatwick Express and taxi. Other smaller London airports include London Luton, London Stanstead and London City airport. St Pancras International Train Station (Eurostar), 10 minutes by underground (Piccadilly Line). This hotel is in a prime central London location and within walking distance to many of London's popular attractions, the theatre, nightclubs, restaurants and bars. A car is not required as there are plenty of public transport options as well as taxis.